Mayor Jim Watson and I share an amusing thought at the silent auction in the new Ottawa Art Gallery. A new gallery in Montreal . My work is now represented by Galerie Blanche on rue Saint Paul Ouest in Old Montreal. I look forward to working with Lyne Parent, Michel-Jean Correia and Catherine Trembley. Oeno Gallery is pleased to present an exhibition of the inspired cast bronze, steel and aluminum sculptures by Canadian artist Dale Dunning. Using the head as a metaphor for human experience, Dunning’s work reflects a romantic sensibility that recalls the Gothic literature of Mary Shelley or the poetic drama of Greek mythology. In this show I have some new pieces and several older works dating back to 1979. I'm showing with the Toronto sculptor Jim Hake. Eclipse at the Sivarulrasa Gallery in beautiful downtown Almonte. I am currently in the group show "Eclipse" with Deborah Arnold, Susan Low-Beer, Marina Malvada, and Sanjeev Sivarulrasa. This show, inspired by the upcoming Eclipse of the sun, explores not only the astronomical context of eclipse but also other connotations of the word . I'm pleased to announce that "Gyptian" 2/7 has been added to the City of Ottawa Art Collection through the Direct Purchase Program. "Gyptian" 2/7, steel, 40" high, 2016. Unravelling… the title of this show suggests many things: the physical transformation of raw materials into something beautiful in the hands of an exceptionally gifted artist; the unravelling of our bodies and minds as we age and mature; the untangling of the mysteries of the human condition – an exploration that art celebrates. 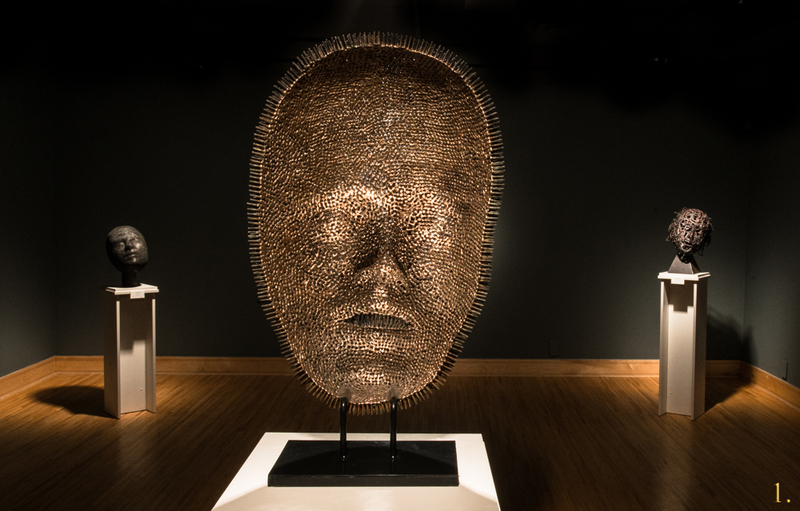 In Unravelling, Sivarulrasa Gallery presents 23 fascinating works in bronze, aluminum, steel, and glass by sculptor Dale Dunning, spanning four decades of relentless creativity – including several new works that are being exhibited for the first time. The exhibition showcases Dunning’s remarkable versatility, his mastery of technique, and his intriguing vision. 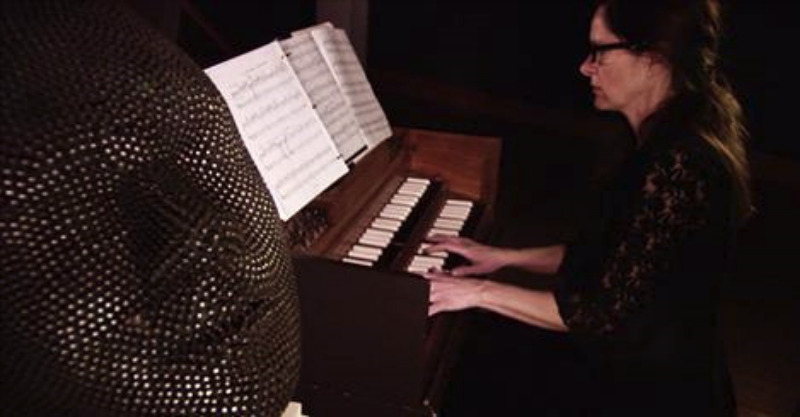 Un clavecin au milieu des masques. And now, a suggestion for an afternoon road trip to two provinces to see two art exhibits by two members of one family. Dale Dunning has the exhibition Personae, at the Espace Pierre Debain in Aylmer, while Annie Dunning, his daughter, has Sapsucker Sounds at Gallery 101 in Ottawa. On the surface the shows are very different, but a closer look reveals how both artists have turned ordinary objects into artworks that are anything but ordinary. Gallery 101 is an unforgiving space for an art show. It’s in a garage that sits in the shadow of the Queensway. Hints of spring have turned the driveway to mud, which a visitor cannot avoid while navigating between the neighbouring businesses’ pick-up trucks. (When I opened the gallery door to leave I banged the back of a pickup.) Inside, the gallery space is industrial bland, all concrete and exposed piping, with a forced-air heating system that is loud, oppressively windy and difficult to avoid, like Tom Mulcair during Question Period. All of which makes it more impressive that Annie Dunning has managed to establish in the space a sense of being in a forest glade. In Sapsucker Sounds, Annie has used a few pieces of wood and metal, seasoned with sound and light, to create an atmosphere that is reflective and surprisingly calming. It all began, the artist’s notes say, “with a found log, filled with holes made by a yellow-bellied sapsucker. Woodpeckers hammer their heads into trees to both find food and mark their territory, and — this part was news to me — they sometimes hammer on metal road signs, “taking advantage of the amplification” that results. It’s this “inter-species cultural influence” that interests Annie. It’s not a large show, only a half-dozen or so pieces, but they are bound by theme and imagination and work together to affect the viewer. One piece, Record, is a small, rustic turntable that spins a brass disc that in turn is read by a sensor. The sensor transmits the signal to a device overhead that fires small hammers into a short log, producing the recognizable sound of a woodpecker pecking. But that’s not all: the sensor also reacts to the propinquity of the viewer, and sometimes produces the same pecking on a metal sign positioned 20 or so feet away (and covered in a painting of a woodpecker on a tree). I tried to figure how the sensor was reacting to my movements, but it was elusive and I couldn’t quite see the answer. It was a lot like trying to get a good look at an actual woodpecker but having it hop around to the other side of the tree. Another piece, Music Box, produces a woodpecker sound, but only if the viewer turns a crank. Next to it is a pile of firewood, topped by a video projection of woodpecker at work. Then there’s a pile of metal “logs” that are lighted from the inside, so the light streams out through a pattern of holes left behind by a woodpecker. There’s more, and every piece helps to create the feeling of being out there, among the trees, in the presence of an industrious and impressive bird. This is a great exhibition for children, as it’s interactive and entertaining. But more than that, it is transformative, as it takes you from a bland space and transports you to someplace wild and enchanted. A bust made of bolts, by Dale Dunning at Espace Pierre-Debain in Gatineau. Over at Espace Pierre-Debain in Aylmer, Dale Dunning’s work looks to another sort of enchantment, one that is darker, and more introspective. 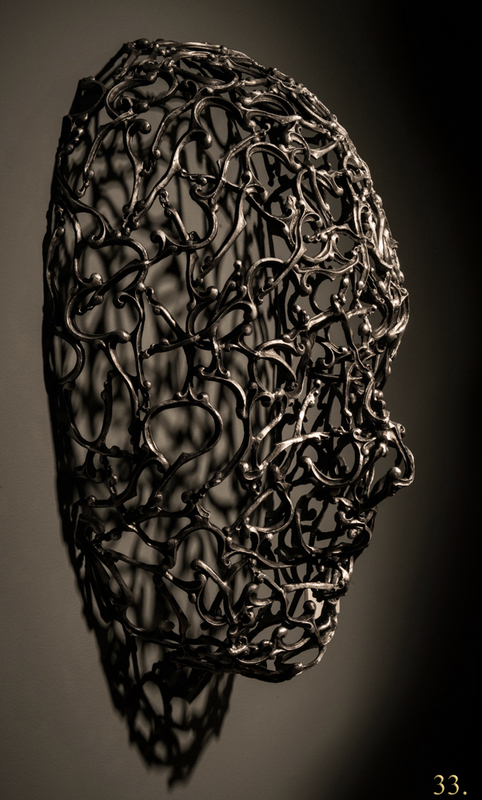 Personae is built around a series of large, metal masks and busts, each inspired by mythology and history, and made of repurposed materials. 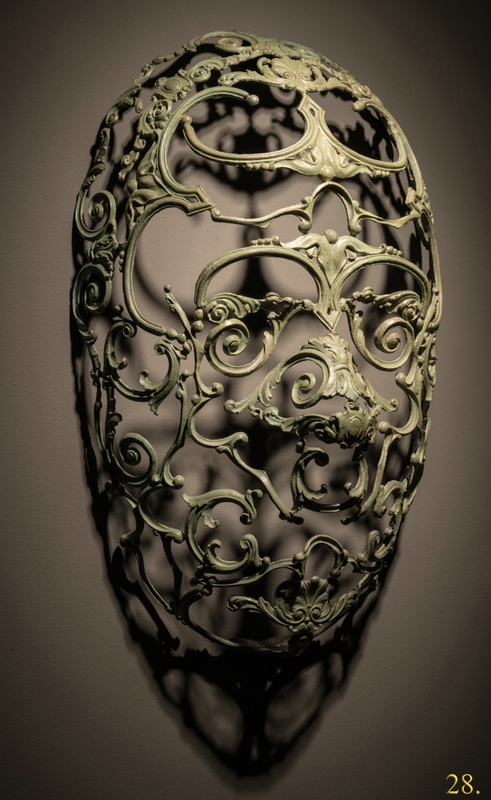 There are bronze masks, in which Dale has turned familiar patterns of decorative wrought metal into enigmatic faces. 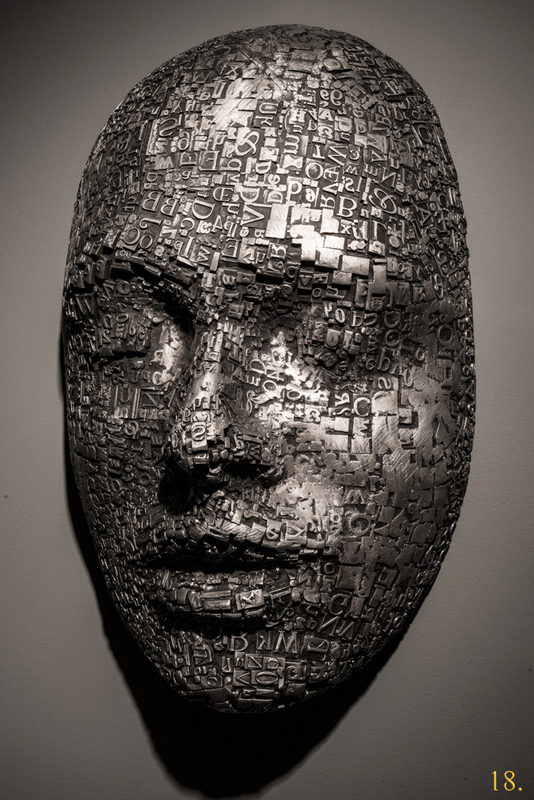 Another mask has a vague human face fashioned entirely from individual letters made of aluminum type, as would be used on a press — hence the mask’s title, Palimpsest, a thing to be written on over again and again. A mask titled Prometheus is made of larger bronze letters, all welded together and with a few stray ends sticking out the back, which made me think of Medusa and her coiffure of snakes. Another, titled the Ineluctable Dream, is, as its name suggests, impossible to ignore, with large wings for eyes. 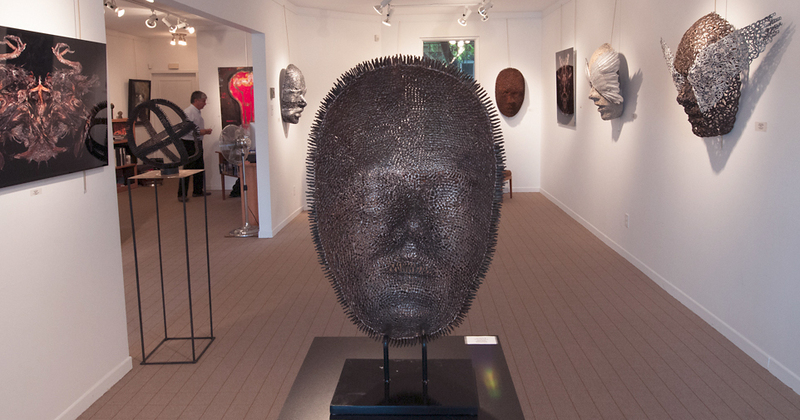 Other busts are made entirely of small bolts, thousands of them welded together and pointed outward, creating considerable depth and unique texture. How endless and meticulous the manufacture of these masks must have been. Dale Dunning creates that rare sort of art in which the process of creating it impresses almost as much as the end result. A slide show of my sculpture at Espace Pierre Debain. The images are numbered in the bottom right corner so you can match them up with the list below. A 2 minute video of my show at Espace Pierre Debain. This is a video posted on Vimeo of my show in Aylmer at Espace Pierre Debain. The show runs to the 19th of April. A couple of shots of my sculpture in the Oeno Gallery booth at the Interior Design Show last weekend in Toronto. Dana Charles is showing the same sculpture featured in "Light Fantastic", the Annual Interiors Edition 2015 of Ottawa Magazine. This is the official invitation for my show at Espace Pierre Debain, in Aylmer, about 45 minutes from Almonte and 30 minutes from Ottawa. The opening is next Wednesday the 11th from 6:00 to 8:00. The show will run from the 11th of March to the 19th of April 2015. The gallery hours are 1:00 to 8:00 Monday to Friday and 12:00 to 4:00 Saturday and Sunday. For more on the show click here, and to learn more about the gallery check them out on Facebook. I will be present at the opening. My show at Wallack Galleries is up to the end of January. Here are some installation shots of the show. I will be showing a selection of my sculpture and digital images at Wallack Galleries in Ottawa. The show starts Saturday, November 29 and I will be present on that day from 2:00 to 5:00. I am introducing a new series called "Koi" which is Japanese for love. The works are cast bronze about 30 inches high and to my eye they have a Japanese quality to them though the elements that form the sculptures are taken from Victorian ornamental details for furniture. Dale Dunning and new sculpture in bronze . The beginning of a new series, as yet unnamed. bestowed with diverse possibilities of interpretations when applied in surface design. The physical tactility of metal and the processes involved in making a sculpture are what fascinate the artist. For more than ten years he has been exploring the reciprocity between open ended imagination and the defined structures of design and symbol exemplified in type. Sculpture & Type is a series of sculptures about reflection and contemplation. The head is generic, non-specific, genderless, and egg-like in form and intention. The artist looks his sculpture as a mirror which reflects back the observer’s experience in new combinations and associations. The works are open ended with no didactic intent other than to see new possibilities. Dale Dunning sculpts heads. His subject matter has not altered in years, but his production is continually evolving, fluctuating, oscillating between classical and contemporary, mythical and imaginary. Michigan-born (sic), New Brunswick-educated (Mt. Allison University in Sackville), he has reached for one of the oldest and most fecund of subject matters. From Brancusi's stylized sculptures, to Mitoraj's classical colossi, the head has been the favourite of artists from the very beginning. Like peering into our own eye, heads in art are the ultimate reflection. Dunning's bronze and aluminium sculptures may seem like a thinking man's art, replete with visual symbolism and cultural references, yet they are unbearably tactile, accessible and entrancing, regardless of size. 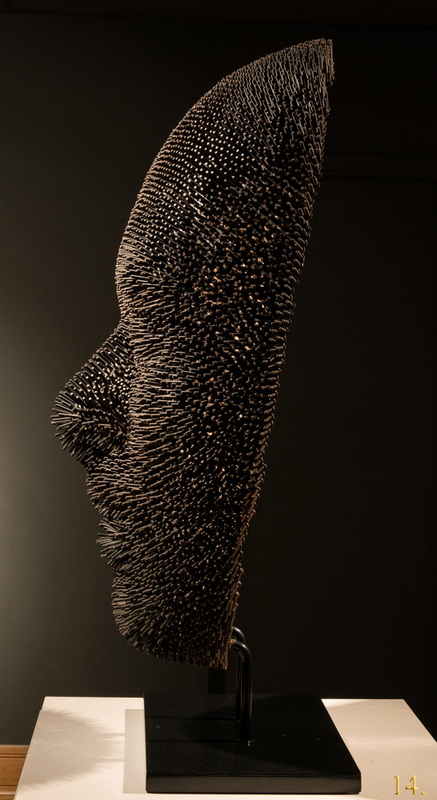 From the fetish-like small pieces that mould themselves in the palm of the hand, to his large scale sculptures with their myriad protrusions and applications. The many allusions to mythology (eg Icarus) give them an aura of antiquity and melancholy, an echo of the past resonating in their enclosed interiors. Some we can peek into, squint to look between the filigree carvings that shape the face. Dunning's work is truly magical. Like so many artists reluctant to write about their own creativity, the impressively prolific sculptor will offer this in his artist's statement: "My sculptures are objects of reflection and contemplation. (...) The works are open ended with no didactic intent other than to see new possibilities." Not much more is needed to explain Dunning's work, if art really, ultimately needed explaining. It is best experienced. Dale Dunning's works are at Galerie D'Avignon on Laurier St. till October 5, 2013. Slide show of installation at Galerie d'Avignon.